Above: A BNSF freight train crossing the Continental Divide along I-40, on our way back to Arizona. A few days in Albuquerque to wait out the weather, quickly turns to a week, nearly. In that time, we enjoy an indoor picnic of homemade tamales with both green and red chile (the combination, called Christmas, by New Mexicans); some salad at Vinaigrette, where we both used to work; a few days hanging out at bike shops, swapping parts to the Surly ECR frame at Two Wheel Drive and talking with the crew over at Bikeworks, over a pint of La Cumbre beer from the keg in the back; and, a few rides in the Bosque and down several of Albuquerque’s 18mph Bicycle Boulevard’s, both of which we consider our old stomping grounds. When charged with the task of getting back to Arizona to resume our ride, we post an ad on Craigslist for a rideshare, and tentatively plan to hitch if nothing comes up. Luckily, friends Rusty and Melissa are looking for something to do over the long holiday weekend. For the last few years, the’ve gone camping, in place of the sometimes stressful Thanksgiving gatherings we’ve all attended. We spend much of the year camping, and when some discussion of riding bikes enters the conversation, we make a plan to ride and camp together for a few days for Thanksgiving, en route to Flagstaff, AZ. The result of our efforts is a memorable holiday on a brief, scenic section of the Great Divide Route near Grants, NM. We find cold nights and some muddy roads, up and over 8200ft. We cook fresh cranberries and other vegetarian delights over a campfire, scouting the Milky Way by midnight. And I hope, we plant a seed that will someday amount to a few weeks or months on the Great Divide for Rusty and Melissa. For good measure, I left my well-used Raleigh XXIX frame for her to ride. As far as I can tell, the deal is nearly done. First, a few days in ABQ. Good New Mexican food is only found at diners and dives, plentiful along the Route 66 corridor. The desert, at 5000ft, still claims some winter. The rain and snow we ran away from in Arizona makes it over the state line to NM, dumping loads of snow on Santa Fe, and a few wet inches in ABQ. Jeremy’s Pugsley hides behind Rusty’s vintage Trek 650B conversion. A quick visit to my favorite bike shops in town uncover some fun surprises. This Surly Pugsley is built with a now-unavailable Maverick SC32 fork. 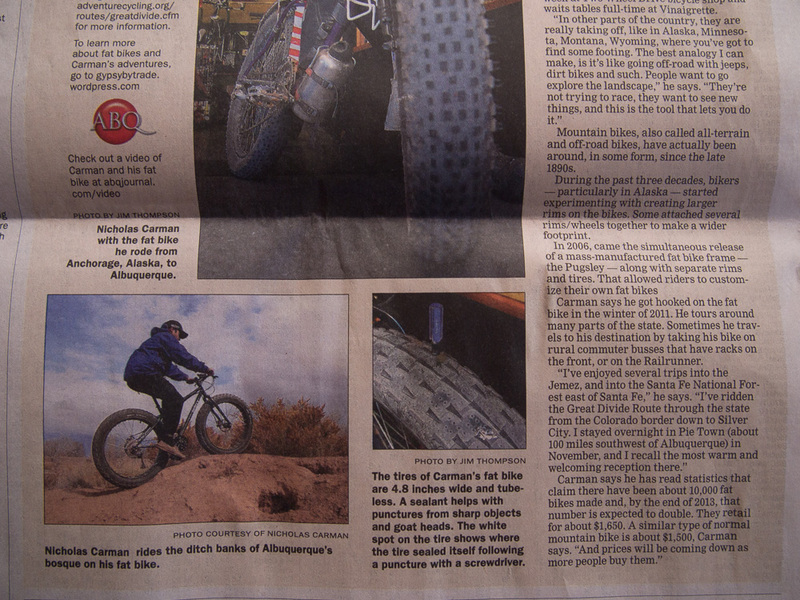 The ride is a revelation, compared to that of a rigid fatbike– less bouncing, more shredding. The fork is no longer available, since Maverick has folded, but they are available used, for a price. Seen at Two Wheel Drive, new Surly tires all carry secret phrases, mostly nonsense, molded along the tire’s bead. This one reads “FIREFLIES OWL HOOTS AND A CANDLE AND A CURSE IN THE DARKNESS”. Weird. Surly. Of course, a ride or two along the Bosque, on the banks of the Rio Grande River is necessary. Rusty rides his rigid Kona Unit 29er, with 2.35″ Schwalbe Hans Dampf tires and Velocity Blunt35 rims. This is one of the top 29″ rim/tire combinations for trail riding and tubeless trail touring. Faster rolling models might be optimal for dirt road riding. He’s working towards a full framebag, most likely one of the new Revelate bags offered in stock sizes. A Carradice saddlebag is employed for overnight affairs. Years ago, I began with one of these handy Jandd Frame Packs. Running out of town on Thanksgiving Day, we land in Grants, NM, the crossroads of I-40, and both the Great Divide Mountain Bike Route and the Continental Divide Trail. Late in the afternoon, we take off up Zuni Canyon. This is a but a small slice of the Divide, but it stands as a good example of what the other 2,725 miles are like. This is Rusty’s first look at Divide maps while on the route. These full-featured maps are a delight, full of reassuring information including distances, elevation, food and water resources, and touristic asides. There’s even more to them, and they are worth the money. More importantly, the Divide is worth a look. What are you doing next summer? Up the canyon, the walls grow taller. Snow lingers on north facing slopes, even though the sun soon has us in t-shirts. The road is mostly dry, but spongy. Slowly climbing, 29×3.0″ tires have some advantage on the soft stuff. They also feel a bit hefty. Thinking, riding, thinking– the perfect bike is out there somewhere. Rusty’s Kona Unit has evolved from the single speed that he brought when moving from the midwest last year, to a fully geared mountain bike with wide bars. A suspension fork is coming soon, although it is not necessary for this kind of riding. This section of road, much like the rest of the Divide, is high quality dirt. Lael has no question about which bike she likes best– her own! She’s talking about full-suspension for next summer, that is, after she lays down some money for a lightweight fatbike this winter. She likes the looks of Surly Clownshoe rims (100mm) and Bud and Lou tires (5″). Set-up tubeless, on a lightweight frame and fork, and she’ll be on her way. We cross the geographic and hydrologic Continental Divide near 8200ft, at sunset. An easy 1600ft climb is a nice way to prepare for a Thanksgiving fête. I’m discovering new features on the simple Garmin eTrex 20– 8224ft and 8 minutes to sunset, moving at 0 mph. A good time to reflect and be thankful. A good time to ride downhill to dinner. Melissa awaits with a campsite and an aperitif, including cold beer and a cheese plate. On the fire, we roast potatoes, cranberries and a vegetarian stuffing dish. The morning is frosty, but the sun is warm. We continue along the Divide towards Pie Town, NM, which I last visited in 2011 while riding the 1985 Schwinn High Sierra. Passing crumbly lava flows within El Malpais National Monument. From afar, lava rock and snow look like dirt-worm pudding, the homestyle dessert made of chocolate pudding and crushed Oreo cookies. And mud, not too sticky, but messy. Messy enough that we don’t move very quickly. Messy enough to turn around. The entrance to this section of road might have warned about being “Impassable When Wet!”, but we had to see for ourselves. This section of the Divide Route also offers a paved detour. Frozen is better, but not by much. My homemade offset double crank– built from mismatched crankarms and an inexpensive square taper BB– is holding up well, and offers more chain-to-tire clearance than my previous bike, despite much larger tires. Why don’t more 29ers have this kind of clearance? Between the Pugsley, the Raleigh 29er, and the 29+ ECR, I’m honing in on perfection. Instead, we shoot back down Zuni Canyon Road, the way we came, with views of Mount Taylor to the north, towering above the high desert at 11,306ft. The moisture than ran us out of Arizona deposited the first major snowfall is much of the region. Just a few miles of hard packed snow, but my mind is already wandering back towards fatbaikes. 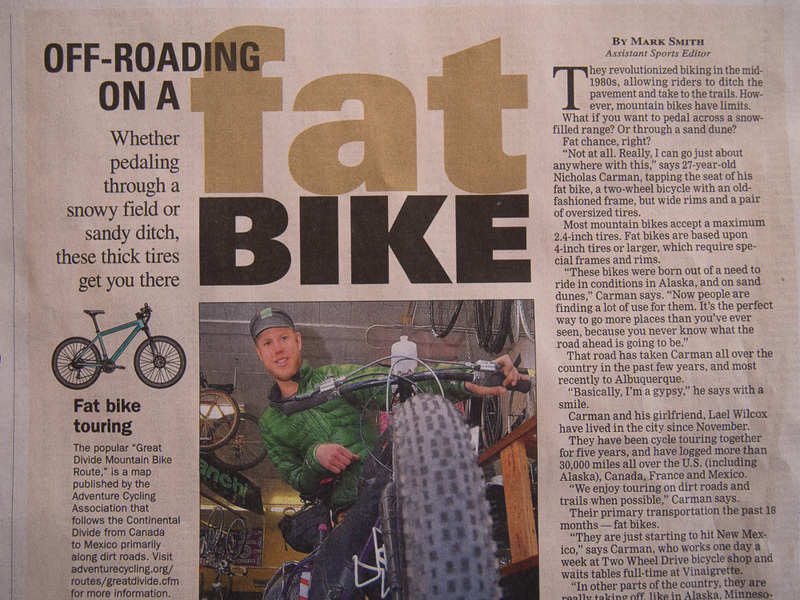 I’ll be shopping for a full fatbike on Dec. 16th in Anchorage. The ECR frame will eventually get properly wide 50mm Rabbit Hole rims. I plan to install some studs in a fresh set of 29×3.0″ Knards. Down, down, down, breezing along the old railroad grade. The Zuni Mountains were once extensively logged, with several railroad lines serving the area. We load up the bikes to complete the journey to Flagstaff. Arriving by night, we stop for a pint at the Mother Road Brewery, named in honor of Route 66, and pick a campsite in the nearby Coconino National Forest. By morning, we realize there might not be much riding left up at this elevation. Lael and I plan to ride some pavement south towards Payson, we we expect to find more dry dirt. Oops– between our escapades with Jeremy, lost in Sedona, and our ride on the Black Canyon Trail, we miss the end of the season up on the plateau of Northern Arizona. Summer persists further south. Zippers are still undermining the reliability of a lot of good gear. Zippers, like chains and cassettes, eventually wear out. Small zippers, like 11sp chains, are more prone to failure. Mismanagement and abuse, like an ill-timed shift under load, can lead to failure. The zipper on my framebag, since being repaired in Flagstaff several weeks ago, has since failed to operate. The bag was also poorly fit to the new frame, as the ECR features a more compact triangle. Luckily, Flagstaff Bicycle Revolution has a framebag in stock sized to a L Salsa Mukluk, close enough to work in my frame. It is a bit small, but it might just fit one of our fatbikes this winter, or I can sell it when I find the time to replace the entire zipper on the Porcelain Rocket bag. I’m hoping to make more repairs to my own gear in the future. Further, the zipper on the rainfly of the Big Agnes Fly Creek UL2 has broken. As opposed to wearing out, like most other zippers, the chain of wound nylon that comprises the “teeth” actually broke while Lael was opening the fly. More robust zippers are found on the Big Agnes Seedhouse SL2 model which we’ve used for years. Big Agnes makes a zipperless tent called the Fishhook, although the design is more spacious, and would be a bit larger and heavier to pack. A simple shelter such as the Seedhouse or Fly Creek without zippers would be ideal. Such a tent would be the ultimate for our lightweight nomadic lifestyle, as it would be for other thru-hikers and long-distance cyclists. Then again, if the Fishhook was durable, it could be worth the weight. I resolve to go ‘zipper-lite’ in 2014. 29+? I’ve got a pair of well-worn 29×3.0″ Surly Knard tires mounted to my wheels, built with comparatively narrow 29.1mm Stan’s Flow EX rims. It works for now– no time for new wheels, no one stocks the right parts– but I look forward to some proper wide rims when I land in Alaska. Until then, I’ve bought a set of fresh 27tpi Knards to be shipped to rural AZ to improve traction. I’ll mount them in a few days. These are first impressions only: I am into bigger tires, and I like 29″ wheels. The 29+ platform has merit, but still lacks an aggressive tire, like the Hans Dampfs and Ardents I am accustomed to (Dirt Wizard should be out sometime…). A suspension fork with true 3.0″ clearance is still unavailable. Big tires are not a replacement for the evolved features of modern suspension. Naturally, a rigid fork is maintenance free, with low risk of failure. That’s good. I’m just not sure if I am a tourist or a mountain biker. It is starting to seem like the latter is true. 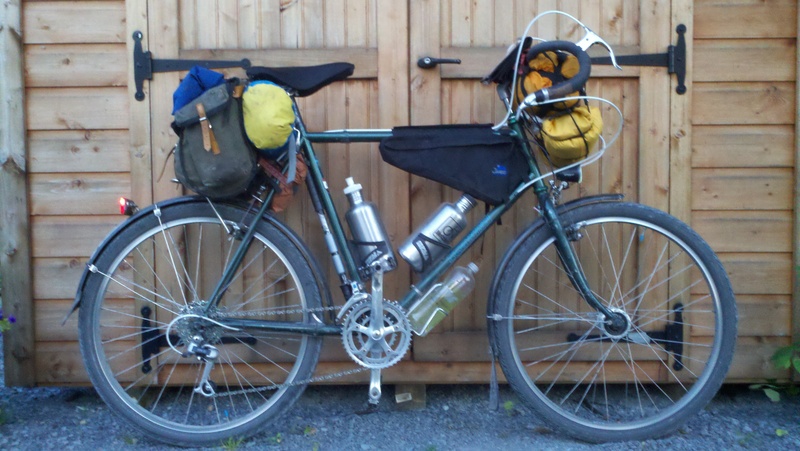 29×3.0″ Surly Knard on the left; 29×2.35″ Schwalbe Hans Dampf on the right. The Knard measures about 75mm wide on various rims, while the Hans Dampf measures about 61mm. The outside diameter differs by about an inch. There’s a difference, for sure, but what about an aggressive 2.5-2.75″ tire, a largely unavailable range of tires (check our the 29×2.5″ Maxxis Minion DHF). With a suspension fork, this might be ideal. More ride time is required, as well as some fresh tires and wider rims. Riding south: A day or two of pavement riding should put us out of the snow, and more importantly, out of the mud that results from slowly melting snow during the days. Back to dirt soon. The first meeting of the Rio Grande Young Farmer’s Coalition was held at Old Town Farm. A sunny 75 degree day and the time to enjoy it are an uncommon pairing these days. I am furiously buying selling building fixing and donating to prepare for our May 8th departure. After surveying the scene from the vantage of a long-unused treehouse, I joined forces with Jeremy and went searching for something else. From a treehouse to the river via bike in less than twenty minutes. From New Mexico to the Netherlands in a day, soon. I rode the Cannnondale Holligan to the Railrunner station in downtown ABQ, and rode the train north to Santa Fe. I sold the Hooligan to Cass and purchased this large-framed Raleigh XXIX+G from an acquaintance, who had at once ridden the bike with both drop bars and suspension fork. I was back on the train within the hour. The new bike rides real good. Framebag coming soon, thanks to Scott of Porcelain Rocket. Many changes to come in the next two weeks. Scott has made an informative video on how to make a pattern for a custom frame bag. I have lists of things to do before I leave. Somehow, I find more interesting things to do that were not on the list. Meet a globe-trotting Japanese cyclist– Takashi– and rendezvous with another globe-trotting cyclist from Holland for late dinner and beers. And, an impromptu sub six-hour campout along the Rio Grande. Not much time for sleep these days. Unlace the busted Phil Wood hub from Cass’ Rabbit Hole rim, and unlace the Rohloff from the long unused 26″ Rigida Andra rim to make one epic wheel– Rohloff to Rabbit Hole. This wheel will find a home on Cass’ Surly Krampus frame. The Phil hub will be sent back for repair. I reused most of the spokes and cut them to length with the Phil Wood spoke cutter at Two Wheel Drive in Albuquerque. Reconnect with old friends. Andy and Stella and family are visiting ABQ from Denver. They hosted us last fall before diving into the Colorado Trail. They rode to the farm for a visit over the weekend. Stella is an aspiring bikepacker and commuter with a promising two-wheeled future. In fact, the whole family frequently rolls on two wheels together. Andy, better known by his blog moniker Big Dummy Daddy, was riding his Pugsley. I sold him my Revelate Sweet Roll handlebar bag. The robin’s egg blue Raleigh XXIX on the left is a recent acquisition, the first 29er amongst twenty (or more) bikes in the family. Prepare coffee and cocoa and cakes; soups, salads and sweets for weekend visitors to Old Town Farm. Bike-In Coffee is a business that runs on coffee, rhubarb cake and two wheels. Our kitchen is actually on four wheels, and is a repurposed 1973 Winnebago. Finally, buying and selling bikes. The Velo Orange Campeur is still for sale. A new (old) bike to come in the next few days! The last time my mom visited in Anchorage she rode 25 miles in the snow, aboard a borrowed Mukluk. And the time before that we explored historic tracks on Grindstone Island on rigid, vintage mountain bikes. This time was a little different. Bikes are still the best way to visit Albuquerque. Several weeks ago Lael’s parents borrowed bikes and joined us for a ride in the Bosque. This time, my parents borrow bikes and ride a mix of sandy singletrack and pavement to visit friends, to Los Poblanos, and simply to enjoy some southwest sunshine. Mom rides the Cannondale Hooligan on Saturday, and the Raleigh XXIX 29er on Sunday. Dad charges around on the Pugsley. Lael runs. Mark’s New London 3-speed is enlivened with (retro-) modern parts, including alloy rims and cranks, a new saddle, alloy fenders, and durable tires. Feeling that the bike is not as great as the sum of its parts, he seeks a new frame to replace the gas-pipe tubing of this old English klunker. This old Trek road frame might have worked well as a host for his parts, but it wasn’t meant to be. There are countless other candidates within reach. Many older road frames with average tire clearances will do– too tight, and the 38mm tires will rub the chain stays, too wide and the caliper brakes will not reach the rim. The considerations for a 700c to 26 x 1 3/8″ conversion (622mm to 590mm) are much the same as a 650b conversion. A 26 x 1 3/8″ wheel is also referred to as 650A, and at 590mm it is 6mm taller than a 650b wheel, which is 584mm. In total, the considerations are about the same for either conversion. Original parts: New London steel frame, Sturmey-Archer hub and top-tube shifter, front hub, front lamp, stem and handlebars. Upgrades: VO 50.4 BCD cranks, Honjo fenders (now painted black), Schwalbe Delta Cruiser tires (replaced with Marathon Plus), Sun CR-18 polished rims, Tektro long-reach dual pivot caliper brakes, VO city bike brake levers, and MKS Sylan Touring pedals. Mark is a mechanic at Two Wheel Drive in Albuquerque, NM. I recently received notice in the post that I am the 18th member of the Society of Three Speeds, much to my surprise, as I have never owned a three speed bicycle. Join the Society of Three Speeds! Membership dues are only $7 until April 8th, at which time they will return to $10. Act now. Three speeds is all you need! Thanks for thinking of me Shawn. 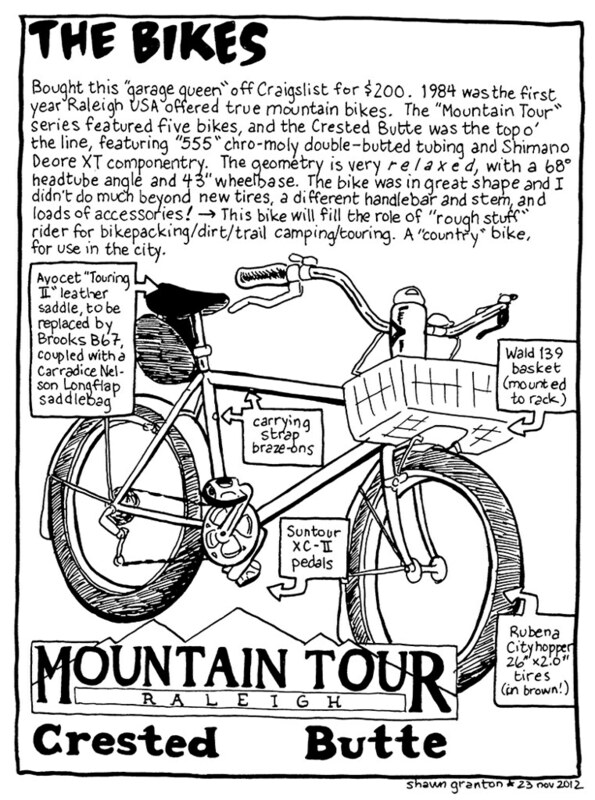 Shawn is also the real-life character behind the bicycle and travel comics, Urban Adventure League and Ten Foot Rule. Family visits for a day and a night. The best way to see the best parts of ABQ is by bike. These photographic renderings serve memory better than reality, but in fact, New Mexico skies are incredible. Four diverse bikes ride together on and off pavement– a bike with little wheels, a fatbike, an all-road bike, and a big-wheeled mountain bike. Another great bike out the door at Two Wheel Drive. I am mesmerized with the chameleonic nature of vintage ATBs. Able to swallow chunky rubber for off-pavement exploration, while still appearing balanced with a lean preparation for riding in-town or cross-country on a variety of surfaces, these bikes do it all. Unlike the vintage road bikes and touring bikes of the era, most of these old klunkers have been under-appreciated in the used marketplace, keeping prices reasonable. This 1987 “Northwest Salmon” colored Raleigh Seneca is a fine example of the kinds of bikes consumers were hungry to ride back in the day, even if they never found themselves “mountain touring”, or even mountain biking. With copious mounting points for racks and fenders, as well as an integrated spare spoke holder and chainstay guard, this bike is a great platform for a modern commuting or touring bike, or even a casual cruiser. Gearing is 6-speed Suntour XC Sport with thumb shifters, offering both a friction and index setting. Brakes and levers are Shimano, and wheels are Shimano hubs to Araya rims. This thing was a sweet ride back then, and is still a sweetie today. At half the price of basic commuting bikes, this thing is steal, especially in this condition. This bike has a unique story. It was available on Craigslist when I first arrived in Albuquerque this fall, and I liked it– I wanted it– but I knew I didn’t need it. Then, in January a customer entered Two Wheel Drive with the bike, claiming that she had been commuting on it but felt it was too heavy. Too heavy? Yes, too heavy to lift onto the bus racks. We bought the bike from here and sold her an aluminum commuter frame with a lightweight wheelset. The combination satisfied her. Ironically, she was carrying an extremely hefty U-lock on her rear rack; the combination of rack and lock must have weighed over 4 lbs by itself. Anyway, I have been staring at this bike for weeks. Still, I don’t need it. As the weather turns towards spring, friends have begun asking about “getting a bike”, which almost always means they want a good bike for cheap. This is not always an easy task. In this case, it was easy. Jettie is tall and stylish, with a sense of utility and irony. This bike is tall and stylish, with a sense of utility and a dose of irony. She’s moving to Oakland soon with this bike, and I’m sure she’ll be the envy of bike-nerds wherever she goes. It’s not mine, but this arrangement is even better. She requested a basic cargo system, and we decided the Wald basket was most appropriate as it allows casual use of a handbag or backpack, and is also very inexpensive at just over $20. As you know, Wald products are still made in the USA, in Kentucky. The basket struts were left uncut to allow future adjustments to handlebar height. I think Wald basket look “right” when mounted at an angle. They’ve been attached to American bikes that way for almost a hundred years. More from the “Out the door” series at Two Wheel Drive here in Albuquerque, NM.